This week has been full, busy, and I'm ready for date night + a movie tonight. How about you? Since it's been a while since I've done a 5 Things, I thought I'd whip up a quick list of a few things that we use daily around here. 1. Boba Carrier. Since our dog is not a very well-trained walker (I'll take the blame...), it's too hard for me to push the stoller and walk the dog. So, the Boba carrier that I got for 15 bucks is perfect for taking the baby and the dog out for a walk. Plus, I love to stick Luke in it while I do some chores around the house. 2. Chicka Chicka Boom Boom. We've been reading to him for months, but he really does like this book. He likes to smile at it and hit it too :) I think it's all the fun colors! 3. Aiden and Anais Muslin Sleeping Bag. After Luke outgrew his swaddle and swaddle blanket, I bought this. It's not a necessary item, but I think it helps communicate that it's nap/bedtime and helps keep him warm. Plus, it's pretty darn cute! 4. Go GaGa Squeeze and Teethe Monkey. Luke loves to chew, slobber on, and squeeze his little monkey. It's cute and the perfect size for popping in my purse for when we are out and about! 5. Fisher-Price Deluxe Booster Seat. We were planning on getting a high chair, but when I saw this, I bought this instead. It's perfect for us now that Luke has started eating some solids! Easy to clean, put away, take when we travel, and it's super affordable too. Plus, it will be something he can use for a long time! 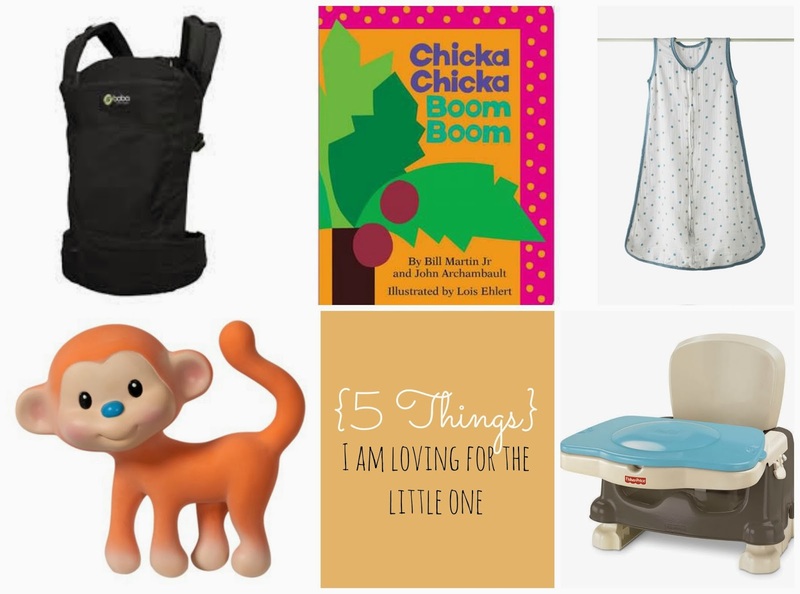 What items did you love (or are currently loving) for your 6+ month old baby? ps. have you seen this sale? They are also offering free shipping :) It it that time of the year for Christmas cards and photo books ;) pss. I adore this one, ooh and this one too! Goodness, this one is adorable too...okay, I'll stop now!